When life gets hectic, it’s tempting to quit spending time on food preparation and just live on junk from the convenience store. The trouble with that approach is that it deprives your body of nutrients and gives it extra fat and salt to process, at just the time when you most need your body to work smoothly! The first three months of this year were difficult for my family: Between the four of us, we had nine illnesses; I had surgery, was in a lot of pain, and couldn’t lift groceries or our toddler Lydia for three weeks; I had migraines more often than usual; and I was working hard to meet deadlines before my full-time job ended on March 31. Normally, I plan the menu, and my partner Daniel cooks dinner every weeknight–but with so many distractions, I didn’t plan well; while I was unable to pick up Lydia from childcare, Daniel had to go get her every evening during cooking time; while I was unable to lift things and then while I was working overtime, I couldn’t do as much of the grocery shopping as usual. We had to make some compromises. What you see in this photograph is the sheet of paper that hung on our kitchen cabinet for seven weeks, from late February to mid-April. You can see that we didn’t have a plan for every night. You can see that we sometimes relied on restaurants or packaged foods. But you’ll also see some nourishing, affordable, homemade meals that didn’t take all that long to make. I’ll explain the things that I see need explanation, and I’ll be happy to do more explaining in the comments if you have questions! Recipe links are at the bottom. “zucchini bread; leftover Black Bean Soup”–I wanted to bake 4 loaves of zucchini bread (using thawed frozen grated zucchini from last summer’s local organic farm share) so that we’d have a tasty, hearty bread for breakfasts all week, but I knew I wouldn’t have the energy to make anything else to go with it. Instead, I thawed one of the quarts of soup that Daniel had frozen when he made a double batch a few weeks earlier. While the bread was in the oven, I coaxed the cylinder of still-mostly-frozen soup out of its plastic bucket into a pot and thawed it by heating it and scraping off the sides, bit by bit (it’s fun! ), until it was soup again. This process broke up some of the beans, producing a smoother soup than the original batch. “N eats early”–Nicholas is our 11-year-old son. I forget where he was going that night, but I figured mac & cheese (Annie’s Natural, from Costco) or frozen pizza (the kind that has a lot of tomatoes and no weird ingredients, also from Costco) would satisfy him if he had a bad attitude toward leftovers, as he sometimes does. Did he eat any vegetables or fruits? Probably not. “frozen veg”=Daniel’s choice of whatever vegetables we had in the freezer, ready to steam for an easy side dish or mix-in for the pasta with Mushroom Sauce, according to individual preferences. Cauliflower and peas are especially good with that sauce. “fish”=whatever kind of plain, individually quick-frozen fish fillets we bought in a big bag on our last trip to Gordon Food Service–recently, we’ve had flounder. If I don’t give specific instructions, Daniel bakes them with a little olive oil and/or lemon juice, and he may or may not decide to sprinkle some herbs, garlic, or paprika on top. “mushrooms w/onions” were sauteed in butter. This is a tasty topping for fish. Eat’n Park is a Pittsburgh-based chain of family restaurants. We like eating there because, as long as at least one of us orders salad bar as our meal or side dish, we can get Lydia something to eat immediately when we arrive. She loves to have a plate with a wide array of foods from the salad bar: garbanzo beans, olives, cherry tomatoes, green peas, carrot shreds, croutons, cottage cheese, cantaloupe, etc. “sushi!” was made with an official maki-rolling mat, which my mother got for us after reading this article. We actually mean vegetarian maki rolls when we say “sushi”; we don’t use raw fish in our homemade rolls, although we sometimes eat it in restaurants. This time our maki included carrot, cucumber, and tofu that I cut up and marinated in teriyaki sauce the night before. The day we ate Cheesy Zucchini Casserole (using up the last of that frozen zucchini) baked in a pie pan and an Apple-Pear Pie was March fourteenth, 3/14, Pi Day! We don’t have a recipe for the Apple-Pear Pie, although Daniel has promised to share his whole-wheat pie-crust recipe soon. The pie filling was made from apples and pears that my friend Lia picked when visiting a farm last fall; she gave me a big bag, and I cut them up and cooked them with cinnamon, nutmeg, ginger, and sorghum syrup to make the filling for two pies right away and another pie in the future; we froze the filling and then thawed it for this pie. “soup at church”–our church participates in a Lenten series, in which five parishes each have a turn to host the others for dinner and a church service. Church of the Redeemer is famous for our soup buffet! I think there were 14 different soups this year. Daniel filled the slow cooker with another double batch of Ginger Black Bean Soup as our contribution, and we had some left over–as you can see, I did the “make a batch of quick bread and serve with leftover soup” thing again the next Sunday! The meal of “fish, sweet potatoes, leftover stuffing” was our Fishgiving Feast using up the stuffing that had been in our freezer since Thanksgiving! We baked the sweet potatoes. We made tacos because Nicholas spotted a taco-dinner kit for $1.60 at Big Lots and offered to make dinner if I would buy it. We don’t eat ground meat, so we put the seasoning packet on canned (drained and rinsed) pinto beans instead, and the tacos were very good. I helped to cut up all the toppings: not just black olives but also lettuce, tomato, and cheddar cheese. We forgot to make the soysage (sausage-style soy food) but nobody missed it. Hey, we actually made 13 different recipes? We did better than I thought! 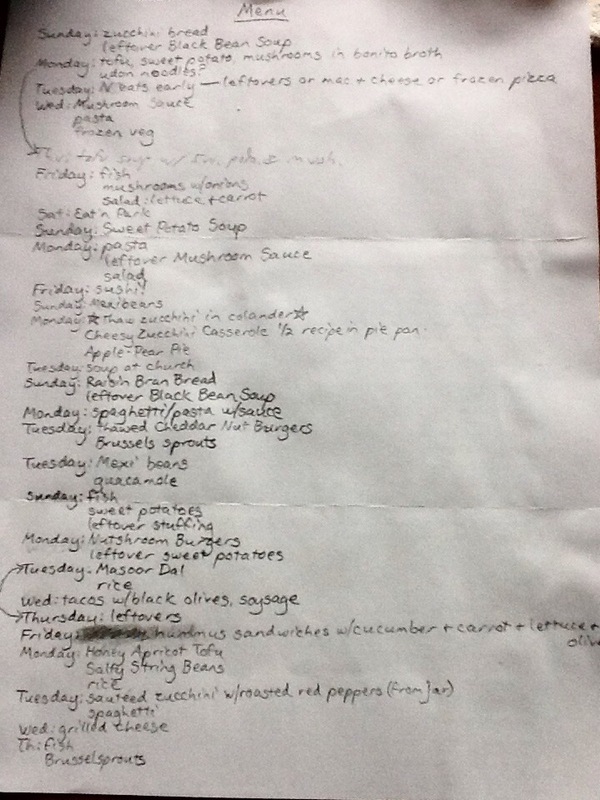 Still, there are 49 nights in 7 weeks, yet the record shows only 26 dinners. What else did we eat? Well, I’ll admit, we went to several restaurants and had at least one Chinese-food delivery binge, and we ate mac & cheese or frozen pizza more often than listed, sometimes failing to add vegetables. There were some nights when we didn’t even get organized for dinner, and each person just ate whenever he/she got hungry some combination of leftovers, scrambled eggs, store-bought veggie burgers, peanut butter and jelly sandwiches (natural peanut butter and fruit-sweetened organic jam on good bread! ), buttered toast dipped in maple syrup, nachos (real cheese and all-natural salsa on organic corn chips! ), oatmeal, yogurt (organic! ), cold cereal, frozen entrees (all-natural vegetarian! ), canned fruit, Nutella, ramen noodles, and/or jelly beans. Not perfectly balanced real-food meals. Oh well. This is real life, here! Getting through a stressful season eating at least some real food works for me! Visit the Hearth & Soul Hop for more great food-related ideas! It’s so interesting to see how others plan meals and I always find it really helpful too. Thank you for sharing your ideas, hints and tips with us at the Hearth and Soul Hop, Becca!